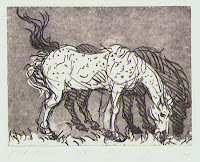 Luis Jimenez, "Adan", soft-ground etching, edition of 30, 1997.
working on his 9,000-pound, 32 foot high fiberglass statue of a bronco which was commissioned for the Denver International Airport. Luis was also a very generous man and often donated his work to non-profit groups. He had consented to make a small print for the Dallas Visual Art Association, now known as the Dallas Contemporary. The DVAA offered a print from a select artist once a year to its supporters. We were chosen to be the print shop to work with Luis for the 1997 print which was to be distributed that September. Instead of bringing Luis down the mountain to Flatbed in Austin, I decided to travel there and work with him at his own Hondo, New Mexico studio. Luis’s studio was a huge old apple-processing warehouse. In one room he had an antique etching press, circa 1840. It had curious damage on its printing bed that looked like impressions of wrenches. Luis told me that this was evidence of damage done by luddites, an original “throw a monkey wrench in it” group. I set up a modest print shop there, with a pancake griddle for a hot plate. I had brought soft ground and inks with which to print. With a little coaching I learned to use his press. The four plates I brought were small, two 5” x 5” and two 5” x 7” polished pieces of copper plate. Luis took time from the sculpture to draw on the soft-grounded plates. There was no preparation on his part; he drew from his heart what he loved: “Adan”, his son, “Annie” his favorite horse, “Mares,” the horses he loved, and “Raven Skull,” the skull of the fledgling bird he had rescued and raised after it fell from its nest. The magic of the mountains brought surprises with the liquid soft ground we applied with a brush. It created beautiful reticulated backgrounds that might be mistaken as aquatints. We proofed the plates and they were good. became editions of 30 published by Flatbed. Luis lived nine more years and worked with us again in 2006 on two lithographs. His death was a tragic accident involving machinery failure while finishing the Denver bronco. He lived well and died well. Bringing Flatbed to him on his mountain was an honor and a very rare privilege. I can’t help but think that these four small prints encapsulated that moment of late summer, late life and a side of Luis that few have been privileged to share.